Traditional Egg Fried Rice is white rice cooked in a lot of oil, with minimal vegetables. We have given a classic Chinese side dish a healthier, and lower carb, twist with our Healthy Fried Rice. Still all the flavour, but a little extra nutritional boost to go with your Friday night takeaway/fakeaway. Our version of egg fried rice uses brown rice instead of white, and only a small amount as we have mixed in some shredded cauliflower for a lower carb alternative. Add in the standard peas and some carrots and peppers for some added crunch, this is a veggie packed rice side dish that is a must alongside a homemade Sweet and Sour Prawn dish. 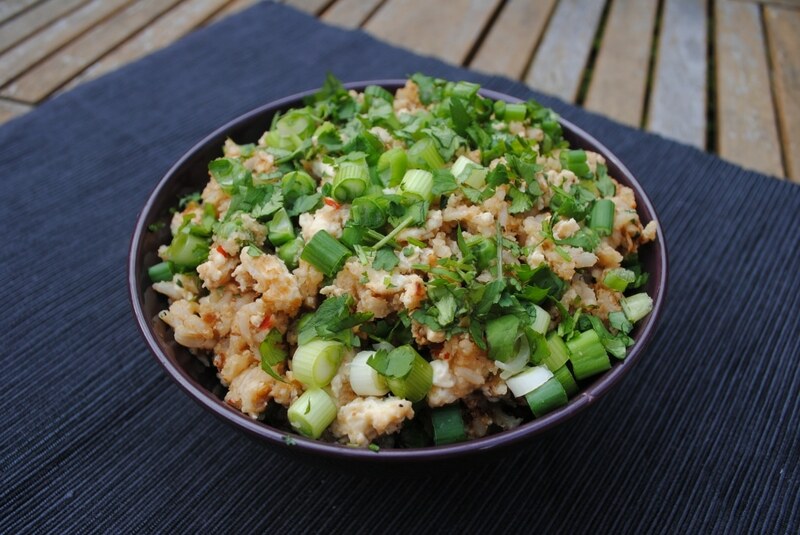 Our Healthy Egg Fried Rice is a no fuss side dish or main meal that is easy to adapt. A great way to use up leftovers, it’s the ultimate throw it all in a pan and cook it up. You can adapt the vegetables in it, add different kinds of protein to suit your taste and even add a spicy kick to it. Is Egg Fried Rice Healthy? Our version is! Regular egg fried rice has about ??? calories per portion, but our recipe is just ??? calories for a portion. It’s a good source of fibre and protein and has plenty of vegetables too. We have also cut down on the oil, so it is lower in fat than the standard side dish. Fried rice dishes are usually high in salt, which is why we have used a reduced salt soy sauce to keep the salt levels to a minimum. We have used cauliflower, peas, carrots and bell pepper for a nice mix. But, this meal is a good way to use up vegetables and anything goes really. We have made it with shredded cabbage/pak choi in it and broccoli in the past. You can throw in some kale towards the end for a green veggie boost too. Can You Use Leftover Rice? Yes certainly can, and it is actually recommended because freshly cooked rice can be a bit too moist. Just make sure the rice has been cooled safely and stored and then you are good to go. Don’t have time to cook rice before making this or don’t have any leftovers to use? Open up a packed of microwaveable rice and fry that up in this dish. Can I Add Meat or Fish? We kept this version vegetarian (it can be vegan if you leave out the egg), but you can add meat or fish. Got leftover chicken? Shred it up and throw it in. You could even finely dice a chicken breast and cook it first before adding everything else. For some extra vegan protein, add some tofu. Love fish? Some prawns or shredded grilled salmon would be good with this, or some scallops if you are feeling fancy. If you are ordering a Chinese takeaway, why not save yourself some money and calories and make the side dishes yourself, starting with this fried rice. Or, make your own healthier fakeaway night with some of our Asian inspired recipes. Why not try these Chicken Satay Skewers or Sweet and Sour Meatballs? One: Add the rice to boiling water and simmer for 30 minutes. Put the cauliflower in a food processor and process until it is a rice consistency. Add it to the rice 5 minutes before the rice is cooked. Drain and set aside. Two: Heat the oil in a large pan and then add the rice and cauliflower and stir well. Add all of the ingredients except the eggs and mix well. Three: Push the mixture to one side of the pan and then add the eggs to the empty part of the pan. Once it starts forming a sort of omelette, mix it all up so you have chunks of egg and then stir everything in the pan together. You can use frozen vegetables in this dish to make it even easier. Want to make it gluten free? Just use tamari, which is a gluten free soy sauce alternative. If you don’t have time to cook rice, us a packed of microwavable rice. Give this dish a fresh twist by stirring in some fresh pineapple just before serving. Add some spice to this dish with a sprinkle of chilli flakes, or a drizzle or hot sauce. Do you want to be kept up to date on more delicious posts like this Healthy Fried Rice? Please subscribe to the blog mailing list (it takes 30 seconds). 1) Add the rice to boiling water and simmer for 30 minutes. Put the cauliflower in a food processor and process until it is a rice consistency. Add it to the rice 5 minutes before the rice is cooked. Drain and set aside. 2) Heat the oil in a large pan and then add the rice and cauliflower and stir well. Add all of the ingredients except the eggs and mix well. 3)Push the mixture to one side of the pan and then add the eggs to the empty part of the pan. Once it starts forming a sort of omelette, mix it all up so you have chunks of egg and then stir everything in the pan together. Lovely super-healthy recipe Dannii, love your brown rice and cauli substitutions. I’ve started using brown rice much more lately and really appreciate it’s delicious nutty taste and texture. And the kids like it too so that’s always handy! Take away egg fried rice is usually yak, I always make my own too. Looks delicious – it’s Friday night and I’m hungry! A nice lot of spring onions there, too. I love this recipe ,I recently posted egg fried rice on my blog too. I’ve seen MySupermarket but it wouldn’t really work for me because in the country you really don’t have the choice of supermarkets to visit. The egg fried rice looks lovely though.